TagsAffordable prices, expertise and a positive learning environment. Banana Spanish School was one of my best experiences in Quito! Nancy and Arturo, made occupational therapy students from St. Catherine University feel welcome and comfortable. It was a great learning environment and I learned so much in three weeks! They were easy to work with and made learning spanish fun. My students commented that learning spanish enhanced their experience while in Ecuador. I enjoyed my experience so much that I have continued Skype lessons to keep improving my spanish. I would recommend Banana Spanish school to individuals and groups to enhance your experience while in Quito, Ecuador! . As a retired 70 year old from England who recently emigrated to live permanently in Ecuador, I would like to strongly recommend Banana Language school to any other aspiring students of Spanish. The teachers are all very experienced and classes can be tailored to suit every individual’s particular needs: what initial standard, hours of classes, one to one or in groups and over whatever period classes required. The school is situated in La Mariscal and within easy walking distance to most amenities, most importantly to hostels of known family houses. The owners will arrange the aforesaid accommodation on request and if required assistance on arrival at Mariscal Sucre airport. classes are also available to include a stay in the Selva in a lodge with classes to suit. I never thought that learning to speak a foreign language could be such an enjoyable experience! From the first until the last Day I was totally satisfied with everything in Banana Spanish School. During my 8 weeks of Spanish classes, I learnt by well educated and experienced professors, Nanci and Wilmar, a super Spanish. I was very happy, because they adapt individual to every student without loosing their concept, cause that is very important when you like to learn or teach a language. Every time I could feel by myself and hear from other students, that the learning success of the students is very important for them. There were no day I did not laugh with my Professors and we build up a very good rapport. I was glad with my school every day. But that is not all, the Professores support you with everything and arrange beside super homestays contacts to everything which you need and offers you sometimes special Tours for weekends. Anytime I would return to Banana Spanish School and can recommend them by heart. Thanks for everything !!! Two years ago I decided to go to Ecuador, to see the people and the culture, to do some volunteering and of course to learn spanish. When I left Austria I just was able to speak in a very basic level. In Quito I worked at Cenit (El Centro de la niña trabajadora; Centre of the working girl). At the beginning I nearly hate my work, because the lack of spanish. However soon I started a spanish class at “Banana spanish school” and the work at Cenit was getting better day by day. Suddenly I understood the children and they could also understand me! I really liked “my” spanish school, the teachers, the atmosphere…. We always had a lot of fun there. The introduction was comprehensible and practiacal and the teachers had a big sense of humor! In august 2007 I was studying spanish in the “Banana Spanish School” in Quito, Ecuador. It was great! The atmosphere is very friendly and all the teachers are professionals. They are all very helpful and intent on making one’s stay as pleasant as possible, not only concerning the spanish language. The activities they offer (cooking- and salsaclasses) are great fun! Back home I’m still cooking some of the recipes Narciza taught me. I couldn’t imagine a better place to learn spanish, especially because Ecuador is known for it’s easily to understand spanish and it’s beautiful landscape. The capital Quito is namend as world heritage site, so there’s a lot to discover. After having classes for a few weeks I was working as a voluntary with market-children in the south of Quito. If someone’s interested in working as a voluntary aswell, the Banana-staff will gladly help with finding the right organisation. All in all I would alsways come back and I’m really in favour with “Banana Spanish School” for giving me such a great time in Ecuador! I attended the spanish-school banana in August and it was marvellous. I learned a lot and still had fun. I enjoyed working with the teachers and the material provided was comprehendible and good to study with. I will never forget this experience. Thank you so much for everything! Hi! I studied at the Banana Spanish School for almost 4 months. I would recommend this school to everybody. My teacher and all the other teachers are very friendly and open people. They are all very experienced in teaching and you certainly notice that. The classes take place in a pleasant atmosphere and the one to one courses make it possible to learn at your own tempo. It’s more like talking to a friend instead of to a teacher. I learned very much and I loved going here. 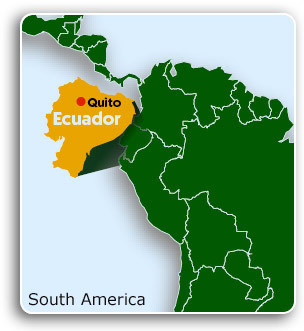 Ecuador is located in northwest part of South America, and is bisected by the equator; it is one of the most biologically diverse countries in the world, and can be divided into four main geographic regions: the coast, the Sierra or highlands, the Amazonian jungle and the Galapagos Islands. As the country is small, each of the regions is easy to access, and offers the interested tourist a real variety of ecosystems to explore, including mangrove swamps, cloud forests, tropical and dry forests, as well as snow-capped mountains, volcanoes, and beaches. Quito is the capital city of Ecuador, and is located at an altitude of 2,880 meters above sea level. The city is home to approximately 2,000,000 inhabitants and is a declared United Nations Cultural Patrimony site for its rich history and traditions. The Spanish spoken here is nearly unaccented, clear and grammatically correct, making Quito a perfect place for a student to take Spanish language class and share in an unforgettable cultural exchange …You could be the next! Our Spanish classes are different because we adhere to three simple principles: Affordable prices, expertise and a positive learning environment. Because the teachers of the BANANA SPANISH SCHOOL are also the owners and managers, students are charged only for the classes they take, eliminating extra administrative and enrollment costs, as well as costs to middle men, which are common in other Spanish schools in Quito. The professors who work at our school are trained professionals with years of on-the-job experience teaching Spanish as a foreign language. We are committed to helping students develop skills in four main areas, including reading writing, listening, and basic conversation. A supportive and positive learning environment makes learning Spanish comfortable and pleasant. We believe that students benefit by interacting with their professors as friends, and we provide shared activities such as conversation clubs, dance classes, goodbye parties, traditional Ecuadorian cooking classes, and excursions to make learning more fun. In this program you´ll get the opportunity to get to know the nature areas of Ecuador and at the same time practice your Spanish. This program consists of 4 weeks: 2 in Quito, 1 in the Amazon and 1 on the coast. The Spanish lessons are in groups. For Accomodation in Quito you will live with a host family where you can practice your Spanish and get to know the Ecuadorian culture. All day Trip to la Mitad del Mundo, Ruinas de Rumicucho (Incas) and el cráter del Pululahua. All day Day off/Transport to Puerto López in the night. Banana Spanish School offers internships in Ecuador for students and individuals. We have agreements with private institutions to allow participants to develop projects based on their needs and interests. This program promotes intercultural personal communication and provides the opportunity to develop complementary academic knowledge and practical skills in professional, linguistic and intercultural fields. After finishing their Spanish classes in our school many of our students like to stay in Ecuador for longer to work as a volunteer. With our volunteer work program students have the opportunity to work together with different communities and to practice and improve their Spanish at the same time. The volunteers have the option to work in Quito in a kindergarten, with street children or disabled children. If the volunteers prefer they also can work in a national park, an organic farm, rescue stations for animals or work in natural protection organizations in different areas of the country. We work together with different organizations that hire volunteers. As a volunteer looking for work you should always keep in mind that the majority of the organizations accepting volunteers for a short time require that they self finance their accommodation and supply including a little of donation for the organization. These classes are great for individuals who prefer the one-on-one classes from home, your office, or anywhere in the world that has access to a broadband internet connection!. All our tutors are fully qualified and trained to teach in an online environment. Your time is precious, so we are flexible. Courses range from basic to advanced, so whether you are a complete beginner or have been studying Spanish for years, we will provide spanish instruction at the right level for you. What are the technical requirements students are required to have? Computers with an internet connection along with head phones (camera is optional). High speed connection or setup process of the software when needed. Each hour of class costs $10 first class (30 minutes) is free! Upon finishing this level, students can interpret, produce and form basic oral exchanges, such as: greetings, restaurant menus, requesting information, producing presentations, notices, brief letters and giving and receiving orders. At the end of this level, students are able to participate in and understand common daily conversations, understand radio programmes, speak on the telephone, understand the context of newspapers, give information about their surrounding and understand others. Their knowledge is sufficient to establish a good level of communication. By the end of this level, students can both understand and read all types of texts, including literary ones. They can also explain, narrate and discuss facts and circumstances with appropriate vocabulary and fluent dialogue. Students have an excellent grasp of grammatical structures. They can ask and respond like native Spanish speakers with minimal errors. The Spanish classes we offer in Quito take place in our school on an individual basis, as well as i small groups of 2 to 4 students. The daily schedule is flexible, ranging from 4, 5, or 6 hours a day depending on the needs of students. Classes include lessons in grammar, reading, vocabulary, writing, and conversation, all complimented by audio, video, and internet aides. Students wishing to spend 6 hours a day in class will be assigned two different professors, one for the first 4 hours in the morning and one for two hours in the afternoon. In addition, we offer classes of 1, 2, or 3 hours in the afternoons, evenings, or on the weekends. We would like to extend a warm welcome and our best wishes to you for a wonderful time in Quito, in Ecuador, and especially in our school, the BANANA SPANISH SCHOOL.